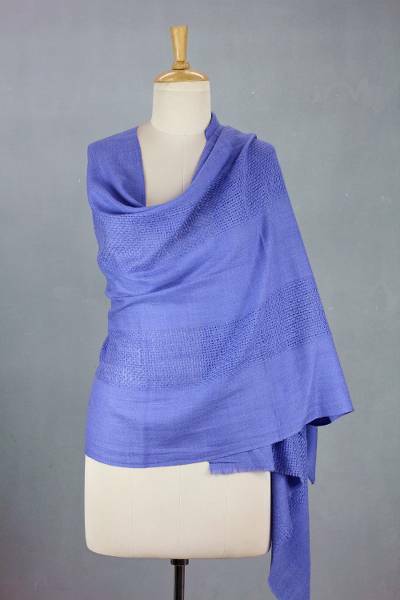 Hand Loomed 100% Wool Periwinkle Blue Wrap for Women, "Periwinkle Allure"
Sajad in India presents a luxurious shawl in sweet periwinkle blue. Woven of pure wool on a traditional handloom, the shawl features wide alternating bands of basketweave and traditional kashmiri chasm-e bulbul diamond patterns. The shawl is finished with a short fringe at both ends. You can find wool shawl 'Periwinkle Allure' by Sajad in accessories categories such as Hand Woven Shawls and Wool Shawls. Enjoy exploring these sections for other Novica treasures. I purchased this shawl for my Beloved and she absolutely loved it. It is very nicely made of good quality material. I ordered this trusting the description and color were correct and I am delighted with it. It is light weight yet the wool is perfect for cool evenings or air conditioning. Despite it's long journey from India it arrived when expected. Thank you so much for my beautiful shawl.